More and more people choose to enjoy their retirement by making use of an RV. 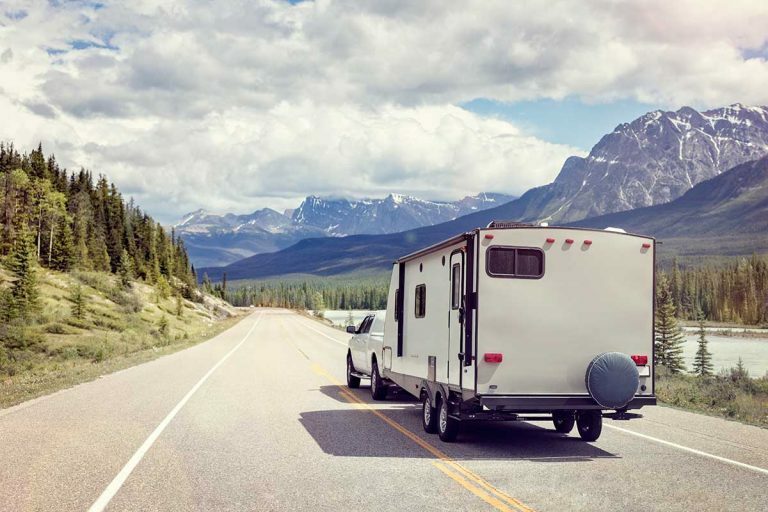 Whether selling their house and going full-time, taking a rig out on the occasional long road trip, or even just renting, recreational vehicles seem to attract seniors – for all the best reasons. If you’re a senior citizen, or even just over 50, I’m sure you’re going to find many of the tips on this super useful. I’ve tried to stay away from general tips that you can find just about anywhere and focus on things that are important for people in their 50’s, 60’s, 70’s and even 80’s and 90’s! Because you are never too old to RV! That’s not a slogan either. That’s the reality in campgrounds across the US and there’s no reason for you not to join the tens of thousands of so-called elderly people who decided to just “disrupt aging” as the AARP puts it, and just go out there and enjoy life! With that in mind, let’s start the tips rolling! Just because you’re 68 or 86 does not mean you can’t RV or that you’re limited to a specific type of recreational vehicle. People of all ages use various rigs and do fine with them. The trick is to find the RV that works for you, depending on your own needs and abilities. Motorhomes are the preferred choice of manys senior RV’ers. These rigs combine the vehicle and living area in a single unit which saves you the need to unhitch and hitch. This is even more of an advantage if you plan on moving from one campground to another often. You can tow a smaller car behind the motorhome with a simple hitch that’s easier to connect. Then use that car when the larger RV is parked in the campground. An additional advantage that a motorhome offers seniors is ease of access to the living area – even on short stops. You can pull over at a rest area of gas station and quickly hop out of your seat to use the RV bathroom. Perfect for a quick nap too – something many seniors appreciate on long drives. And you can do all of that even in bad weather! Motorhomes are meant to be driven. 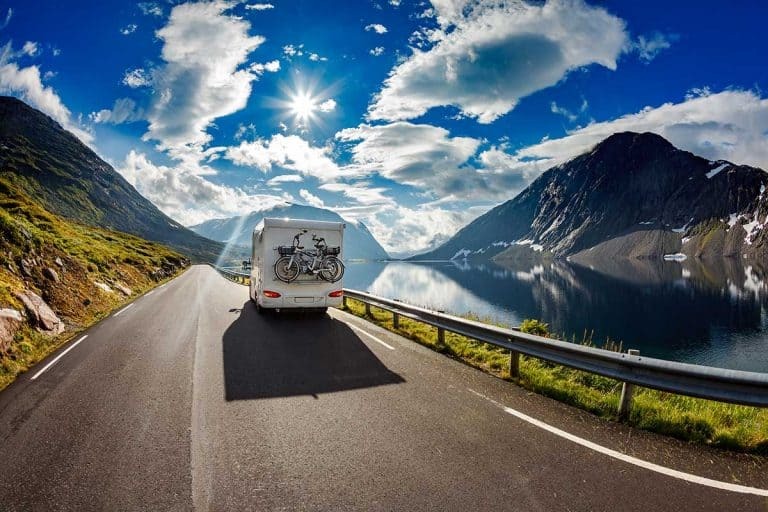 If you plan on staying for an entire season in the same place, a motorhome is not a good option. 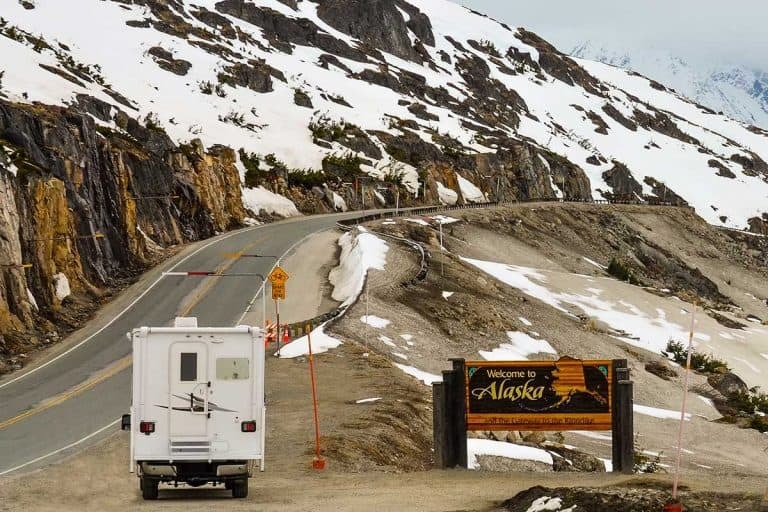 Hitching and unhitching of the RV to the towing vehicle isn’t much of an issue in this scenario which is why many people prefer a a towable. 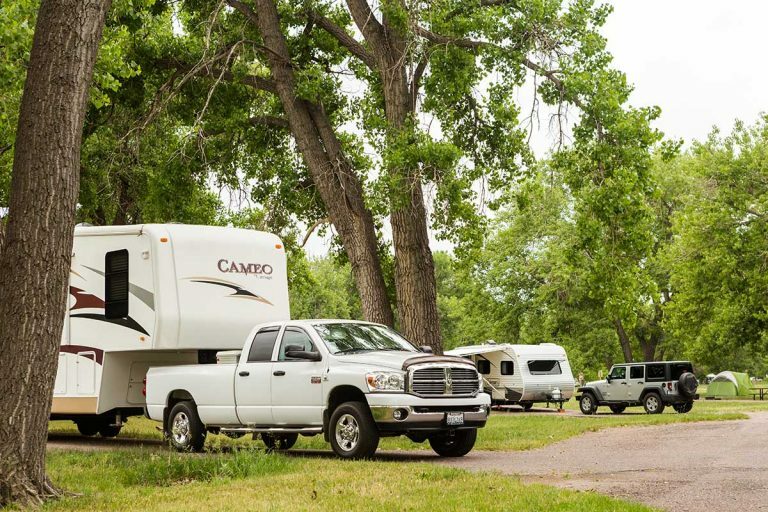 Of the towables – 5th wheels have two benefits that appeal to many RV’ers of all ages: They’re easier to tow and they generally offer more living space. If you have back or knee issues, you may prefer a single-level floor plan with no steps. This usually means a travel trailer and not a 5th wheel as the latter have one area that sits above the truck bed. There’s usually a small stairway leading to that section and that’s where you’ll usually find the master bedroom. A travel trailer on the other hand will have a flat floor and no steps. If you do have a 5th wheel – make sure the steps are safe by installing a handrail as well as led lights across the steps. The last thing you need is a nasty fall in the middle of the night… in the middle of nowhere. That’s true for anyone – but even more so for older people, especially those with osteoporosis. Pickup trucks can have hoop steps or a nerf bar that offers a longer step across the body of the truck. Choose the latter for a comfortable and easy way to get into your cab. Whichever you choose, make sure the step is solid and stable. If you feel the step in an older truck getting a “bounce” to it – handle the problem in time and replace the step if necessary. Your RV steps should be stable and sturdy. If you’re shopping for an RV, look for steps that get all the way to the ground so that they’re well-supported when in use. Try the steps to make sure they don’t wobble or move as you climb. If they do – you can actually replace the steps of the RV fairly easily – and you should. Even when the RV steps are well-anchored, you still need to make sure they offer good traction when you actually place your foot on them. Remember, you’ll be using them in all kinds of weather so they need to provide that traction even when wet. If your current steps don’t – get heavy duty non-slip tape (Amazon link) and add at least one strip to each step. Yes, still on the topic of steps and stairs! Lots of them here because keeping safe while using the RV is super important for seniors. Last tip on this topic though, promise. Some RV steps already come with a built-in rail. If yours don’t add them for a safe and secure entry and exit. RV handrails are adapted for outdoor use and should be easy to remove and store – without losing their functionality. The Rail Mate (Amazon link) is a popular choice. Stay extra safe when entering and exiting your RV shower stall. Avoid shower pans that are higher up above the floor or that have any kind of step or elevation between the pan and the bathroom floor. If you can, choose a large shower stall with a bench – safer to sit down when you’re feeling weak. You can never be too careful in the shower. Even if you have a full-size RV shower with a bench, it never hurts to have an extra place to hold on to if the need arises. This is a standard feature in showers designed for the elderly and should probably be included in showers for people of all ages. You just never know where you might lose your grip and need to quickly reach out to a handle to prevent a fall. Still in the wet and soapy area – make your shower pan anti-skid too. Either buy a non-skid bath/shower mat that’s anti-bacterial and mold-safe too, or use adhesive anti-slip bath strips. #13 Install a handle next to the toilet too. It’s not something people often tell you but the truth is, getting up from the toilet does become harder as we age. Depending on your level of fitness and strength of quad muscles, you could find yourself grabbing for something around you to pull yourself up. If that’s the case, install a non-slip handle next to the toilet too. Almost everyone experiences some deterioration in eyesight at some point, often beginning in one’s early forties. In addition to a quality pair of glasses, adding light can help. You can easily add lights around your RV with battery-operated led lights like these (Amazon links). Good places to add them would be inside cabinets, above kitchen counters, under shelves and just about anywhere in your RV where you need some extra light. Most modern RV’s already come with great external lighting systems. These are important for seniors for two reasons. First, they can help those with failing eyesight, as mentioned above. Secondly, they can deter miscreants approaching your RV. This can add to your sense of safety especially when boondocking away from a campground. Sometimes you need to leave the RV and walk for a bit. And this can happen during night time as well. It can be something as simple as walking to the office of the campground after 6PM on a short winter day. 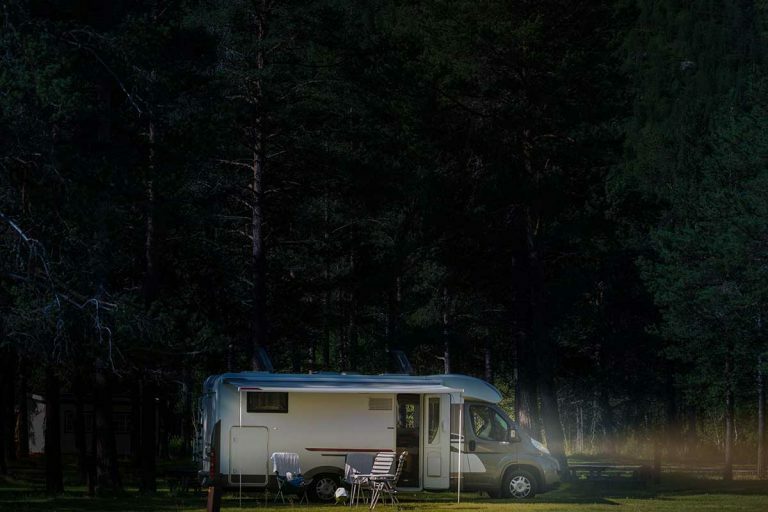 Because you’re RV’ing, you’re more likely to find yourself in an unfamiliar environment when that happens – and this is where having a good light can literally be a lifesaver. Choose a headlamp over a torch light, so you can keep your hands free. A properly adjusted headlamp means you never need to take a step without knowing what your foot might land on. And keep the headlamp within reach near or even on your RV door – so you won’t forget to use it. RV’s are vehicles and homes in one and as such they have many systems you need to operate at some point or another. Many of these can be either manually operated – or automatically, using a small engine. Many senior RV owners choose the latter, to save on potential back pain. This is something to look for when you buy your RV. Opt for things like an automatic leveling system, an electric awning, electric jacks and electric steps. Make things easier – after all, this is your time of life to enjoy yourself and get others – or other things – to work for you! Just like when traveling elsewhere, it’s good to have spare prescription eyeglasses with you. This is especially true for the designated driver. You may be going places where replacing a pair of eyeglasses will be more expensive than back home or just take a long while, keeping you stuck in one place. What’s more, you may be boondocking somewhere with no eyewear shop nearby. A separate pair of prescription sunglasses can be your spare – although it will limit you to driving during daylight. Daily medications for chronic conditions are just a fact of life during our golden age. RV’ers are no different in that respect. Since you’ll be traveling, it makes sense to keep a decent supply of your medications on hand. Make a list of all of your meds – daily or otherwise and make sure you stock up before hitting the road. Keep medications in a cool area. If you’re towing in a hot climate, bring the medications to the air-conditioned towing vehicle on a driving day. In case you’re RV’ing full-time, or for prolonged periods of time, you may not be able to keep a large enough supply with you at all times. That’s where Walgreens, CVS, Rite Aid and even Walmart can come in handy. Your doctor can have at least some of your prescriptions sent to any of these networks, kept there on file. Ask your physician to provide you with the prescriptions in paper form too, as a backup. Should a medical problem occur, it’s good to be able to reach out to your regular physician back home. If you have an established relationship with a good doctor, that’s good news. Tell them about your RV plans and see if they can be available to you over email of phone. Yes, there may be times when you’ll have to be seen by a physician – a different one, away from home – but having access to your regular doctor who knows you and your issues can save you at least some appointments. If you suffer from a medical condition that requires constant checkups, it may be wise to plan your travels accordingly. Many RV’ers choose to come back to the their home town for these procedures. Ask your caregivers to see if you can have all of your tests and checkups during a certain month of the year, so you can travel away from home the rest of the time. Even if you’re very technical and can fix some things on your own, it’s best to be able to call for help when necessary. Roadside assistance through Good Sam, Triple A or a similar company, can mean help will just be a phone all away. 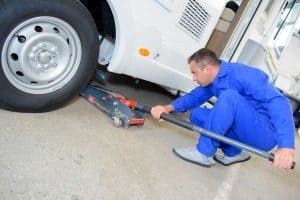 For seniors with back problems or other health issues, such a service can help avoid the pain and potential damage to your health that changing a huge trailer tire can cause. Your RV is going to get you places. And not all of these places have good cell phone coverage. When we traveled to Alaska via the Alaskan Highway, we were without reception for days on end. While being off the grid can be enjoyable at times, it’s good to have a form of emergency communication. That’s where a satellite phone comes in. These phone rely on direct connection to satellites so they have reception anywhere on the face of the earth. They’re expensive to use but then again, they’re meant for emergencies only. And when you’re on the road, emergencies can happen. Even more so with older people who are just more prone to some health issues. It’s good to keep in touch with your nearest and dearest – even when they’re no longer near you geographically. It will help put their mind at ease and you’ll enjoy seeing the grandkids grow up. Some seniors still avoid electronic gadgets and computers – and that’s a legitimate choice. However, even if you don’t have a smartphone, keeping a small tablet or laptop on board your RV just to operate video calls is a good idea. Use Facetime for Apple devices or Skype for any others and you can easily connect with people back home. Most seniors travel as a couple or on their own, so a queen bed is usually enough. However, many RV’ing grandparents love having their grandkids over for shorter trips. While a bunkhouse floorplan doesn’t make sense for most senior RV owners, hide-a-bed couches and dinettes certainly do. Your spacious living area can then be turned into sleeping quarters for the young ones when they join you on a limited-time basis. And once they live, you bring them back to their usual setup and have the RV back to yourself again. Memberships in RV clubs cost money but joining forums or Facebook groups is almost always free. 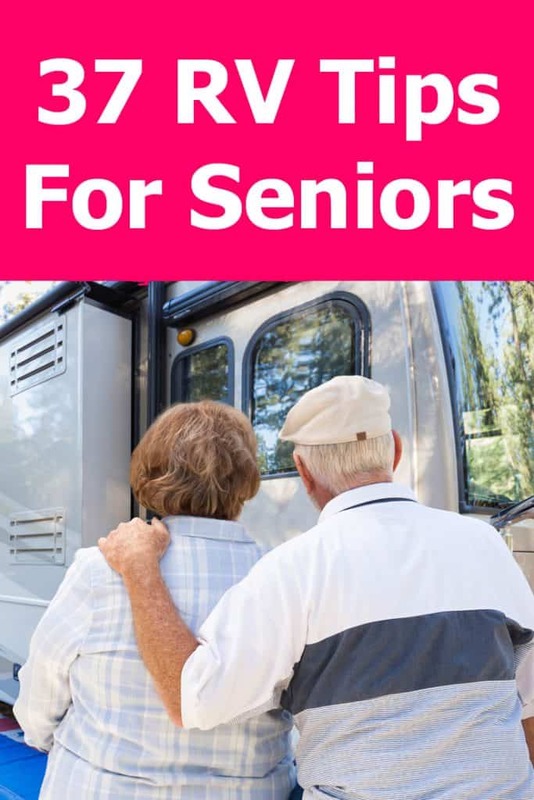 While they don’t offer the same perks, you can connect with other like-minded RV’ing seniors through them and meet new people. My favorite RV forums are The RV Forum Community and RV.net by Good Sam. Combine safety and company by traveling in a caravan. What this means is a group of RV’s traveling together from one destination to another. These are usually events that are organized around routes, such as going to and from Alaska, or going along a famous route like the Oregon Trail. The aforementioned forums, Facebook groups and clubs are where you can find information about such events. Keep in mind that this also means adjusting your pace to that of the group. These events aren’t for everyone, but hey, you can give it a try. Worst case scenario, you can always say goodbye and take a different turn. Rallies and meet-ups are another favorite of senior RV’ers who can enjoy slow traveling and long stops for good company. These events are often organized by the clubs we mentioned earlier, so that’s where you need to start looking. There may be a fee associated with joining a rally but more often than not, it’s just about camping together with like-minded people and having fun! Yes, you can work and have fun at the same time! Many national parks, state parks and campgrounds look for employees during high season. While some offer payment, others barter a camping spot for a partime job. These places often prefer to hire more reliable and experienced seniors to work for them. The job can be a camp host – literally managing a campground in a park – or it can be include part-time small chores like office work or even mowing the lawn. These openings are often posted in the park website, so it’s worth checking your favorite park’s website a few months in advance. Employers often turn to forums too, so keep an eye on those as well. Volunteering can be a great way to meet new people while on the road and make the most of your retirement. What’s more, although defined as volunteering and not as “a job”, some places will let you use their facility to park the RV as an added perk. Some parks may even offer you a site with hook-ups for long-term volunteering as a docent of host. The AARP is the largest non-profit organization for people age fifty and older. Yup, you just have be 50 years young to join the AARP and get your membership card. That card will get you discounts and perks in many places across America, so it comes very handy for senior RV’ers. The AARP’s new moto is #disruptAging and I really can’t think of a better way to do that than RV’ing, can you? This pass will let you in for free into any National Park in the US, as well as national forests and BLM forests that have an entry fee associated with visiting them. This is where you can order yours online – or you can just get it wherever national parks passes are sold. US citizens and legal residents over the age of 62 can get this pass for a one-time fee of just $10. Compare that to the $80 of an annual pass and you can see why this is a really sweet deal. What’s more, the pass is valid for your vehicle and everyone in it – grandkids included! And if you’re not an American, buy it for the full $80 price – it’s still going to be worth if if you’re on an RV tour of the US and the money does go to a great cause. Wrapping up this list with a few general tips, my next one is to stay organized. The older we grow, the more likely we are to experience those aptly named “senior moments”. Well, the benefit of traveling in an RV is that you can move around, experience new places and still stay in your familiar home environment – at the same time! Make the most of that by keeping things organized. Know where your tools are, where your medications are etc. With so many storage compartments in every direction, a good list can be a lifesaver. And read my tips here for making sure you never lose your key and get locked out of your RV. I’m not talking just about driving speed here. As mentioned above, life on the move means we’re constantly experiencing new situations and new places. As wonderful as that is – it can also be stressful at times, especially when you think there’s time pressure. It’s good to remember that there is no such time pressure. Not really. Even if you have to vacate your site by 11AM, don’t rush it. Take the time to go through your checklists and gently drive out. Everyone around you is in the same boat – and they all have all the time in the world. This isn’t your job – it’s your fun retirement, RV’ing at your leisure! Yes, that’s an actual tip. Anything new can be stressful and RV certainly can. There’s a learning curve and that on its own can be daunting. But with time, you will learn to get to know your rig – and things will get easier. Remember that and remember that you’re doing this all to have fun and enjoy your retirement. This is for you and it’s your time – so have fun, and lots of it! If you’re reading this and you have experience RV’ing as a senior, let me know what you think about those tips. More importantly, add your own! 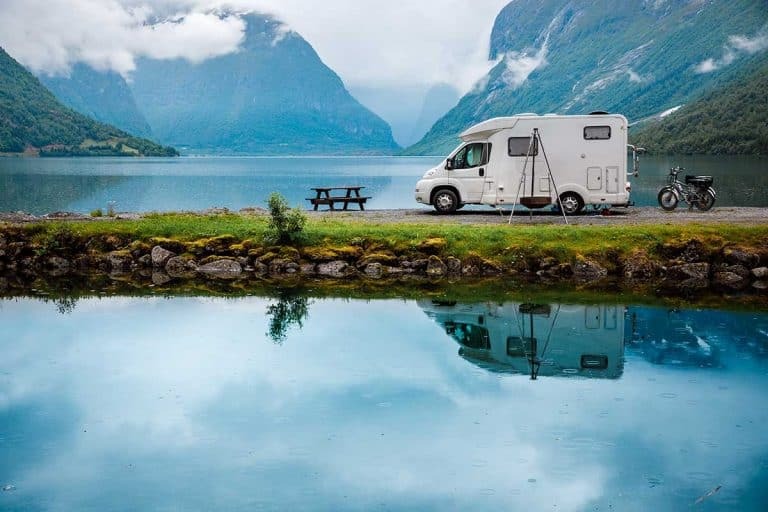 Nothing beats hands-on experience and I’m sure seasoned owners of motorhomes, travel trailers and 5th wheels found their own relevant tips along the years. Please do leave me a comment and share your own – thank you! 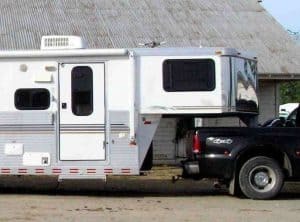 RV Rental vs. Car & Motels – Which Is the Cheapest Vacation?